Lancaster Green Is Residential Amenity Space….. When RBKC first began planning for this project they made no mention of the open space on the site, as though it didn’t exist. At that time the Grenfell Action Group queried the absence of any reference to Lancaster Green, and officers in the planning department didn’t know what we were talking about. They had never heard of Lancaster Green, even though it occupied half the site they were planning to develop, and was listed on the RBKC website as a local park. Later, under pressure from us, they did at least pay lip service to it, but it soon became clear that their version of Lancaster Green was very different from ours. On the map above all the green space is clearly marked in green. Local residents regard all of this green space as Lancaster Green. There is no reason not to, as it is not enclosed except by the surrounding streets and roads. The Council, however, have decided that only the area marked in bright green is Lancaster Green. There is no logical reason to define Lancaster Green so narrowly, except perhaps that it serves their own interests to do so. This is illustrated in the map below (one of the Title Review documents) by the swathe of yellow shading added by the Council’s legal team. The planners were confronted with this information in a meeting of the KALC Working Group in February 2011, but they dismissed it as irrelevant. Strangely, they took the view that any problem would apply only to the playground (to the left of Grenfell Tower), and since they were intending to retain the playground, the problem was therefore resolved. There is nothing in the minute of the meeting to suggest that the solicitor who was brifeing them made any attempt to correct this obvious ‘misunderstanding’ by spelling out the implications of the Title Review for the rest of the Lancaster Green area. One has to wonder why. Was this just carelessness on his part, or could it have been collusion with the pretended ignorance of the planners? Could it be that the Working Group members had no intention of allowing this inconvenient information to deflect them from their intended course, and so they contrived to ignore it? It is hard to believe that they didn’t realise the significance of the yellow shaded area and its’ implications for the academy, which they were determined to progress, come what may. 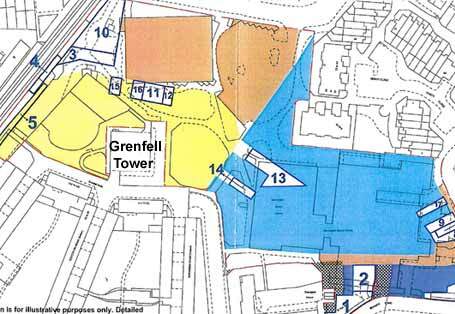 It is clear from the yellow shading on the map that Lancaster Green was created as residential amenity space for the residents of Lancaster West Estate, and especially for Grenfell Tower residents who would otherwise have no external amenity space at all. This information must have been an unexpected and unwelcome surprise for the planners because the maintenance of Lancaster Green had long been the responsibility of the Parks Department. Hence, its origins as part of the housing estate had been obscured, and the planners had wrongly assumed that the open space belonged to the leisure centre and they could use it as they wished, and dismiss our objections. According to the Open Spaces Society it’s not unusual for this kind of confusion and misunderstanding to arise in relation to residential amenity space attached to council housing estates, and once the true origins of such amenity spaces are discovered another interesting anomaly comes into play. There is a frequently misunderstood and overlooked provision in Section 22 of the Commons Registration Act of1965. Under Section 22 applications to register a Town or Village Green must normally include a significant number of witness statements as evidence of at least 20 years recreational use by the local community ‘as of right’ (meaning without permission of the landowner). However Section 22 also provides that ‘land allotted by or under any Act for the exercise or recreation of the inhabitants of any locality’ is entitled to registration regardless of whether the ‘as of right’ condition can be met. Lancaster West Estate was almost certainly built ( in the mid seventies) under the authority of the Housing Act of 1957, which gave local authorities both the responsibility, and the powers needed, for the massive slum clearances and housing regeneration projects of the 60’s and 70’s. It seems certain that Lancaster Green was created under this parliamentary authority, and it should therefore be entitled to the protections available under the Commons Registration Act. Time is short, but it may still be possible to make an application for registration as a Village Green. This will need to happen before planning permission is granted, which it almost certainly will be in September. Any volunteers? 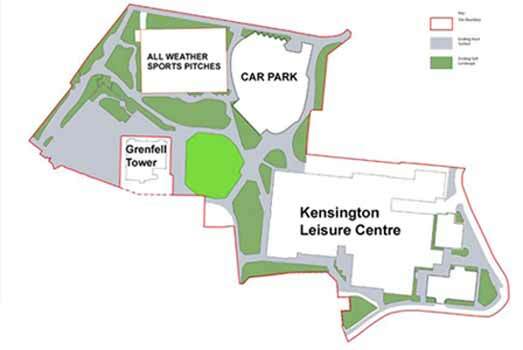 The Grenfell Action Group has repeatedly raised the Lancaster Green issue with the Council in recent years, and we have repeatedly confronted them with the Secretary of State’s Planning Policy Guidance for open spaces, with the GLA Open Spaces Strategy and associated guidance, and with their own open spaces policy as set out in the RBKC Core Strategy. As if all this wasn’t enough, here is yet another reason to afford Lancaster Green the full legal protection to which it is entitled. We may never win this fight to save our green space, and protect our community from this monstous and inappropriate overdevelopment. Indeed we were never so naïve as to expect that we might win. We know the system too well, and we know the Rotten Borough too well. Nonetheless we will continue this campaign, and will seize every opportunity to reveal and uncover the truth about their ruthless and self-serving machinations.